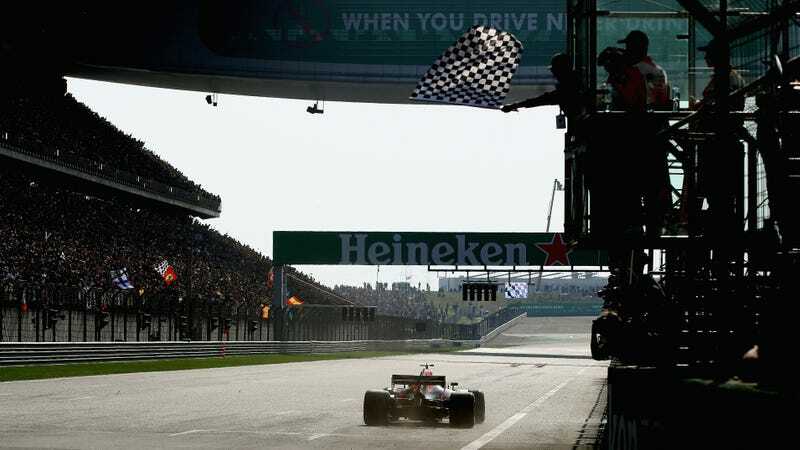 Daniel Ricciardo takes the checkered flag, on the right lap, at the 2018 Formula One Chinese Grand Prix. After a miscommunication between officials ended the Formula One Canadian Grand Prix early and caused a lot of grief for Winnie Harlow, the celebrity who waved it, F1 could start using a computerized checkered flag. No, really, F1 may hand the most iconic symbol in motorsports to computers over a rare mistake. This all started after the real checkered flag flew on lap 69 of 70 in Canada, because of a misunderstanding by a local official who thought the cars were on the last lap when there was really one more to go. The timing of the flag led race stewards to take away another lap, officially ending the race at the 68-lap mark. The lap losses didn’t cause too much trouble in the finishing order, but cost Daniel Ricciardo a fastest lap that he set after the race was deemed official. Whiting said earlier this week that F1 would just have to do a better job of briefing people working at the races, since the series travels all around the world and is “dealing with a lot of human beings, different countries, [and] different languages.” That was a mild, logical response. Whiting said that he will now consider having the official signal for the end of the race shown on the light boards above the start/finish line, which would over-ride any issues with the actual flag. “But if you’re going to do it automatically, then you’ve got to think about exactly when you’re going to do it, when you’re going to activate it. “It’s not completely straightforward, it needs a little bit of thought. “We need to try and get to the situation where drivers only look at the chequered flag on the light panel. If they don’t see that, then the race hasn’t ended. An early checkered flag presents a lot of problems. Like at the Canadian Grand Prix, most drivers and teams opt to keep racing when they know the ending got messed up—it’s better safe than sorry. But there’s always potential for some drivers to slow down or for marshals to step onto the track, thinking the race is over. Plenty of marshals thought that in Canada, too, since they were waving celebratory flags for winner Sebastian Vettel after the checkered flag flew. Whiting is right in that this kind of thing doesn’t happen often, though. Before the Canadian Grand Prix, the last big mistake like this one was the 2014 Chinese Grand Prix that ended a lap early when the checkered came at the wrong time. That could be an argument for or against an automated flag: Almost every race, it won’t matter because the real checkered will come out at the same time as the computerized one, but at almost every race, that means a computerized flag wasn’t needed. And if F1 does go through with this, any mistakes with the real checkered flag would remind everyone that our once sacred motorsports icon is now just a meaningless prop. There’s a good metaphor in there, somewhere.